When remakes of classic movies come to theaters, there is often hesitation among fans that the remake could never be as good as the original, especially if there are multiple remakes to begin with. Despite this, many consider this latest version of “A Star is Born,” whose original debuted in 1937 and went on to have three remakes, the best version yet. The film features Bradley Cooper as Jackson Maine, a country/western singer on the decline. One night, he meets a waitress/aspiring singer named Ally, played by Lady Gaga. They become instantly connected after he hears her sing. Their story of love, music and pain takes the audience on a whirlwind ride that captivates audience members. 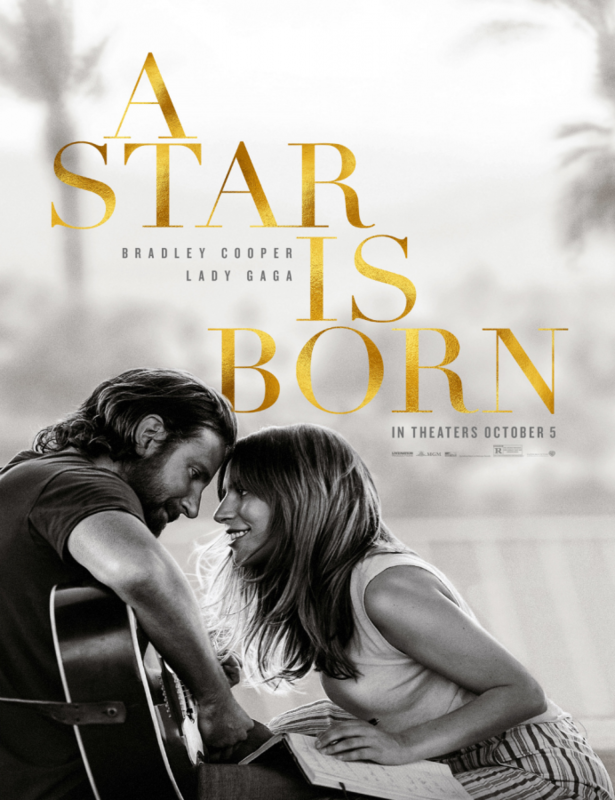 While good acting is expected from Cooper, Gaga knocks it out of the park in her film debut with impressive vocals and acting that tugs at the heartstrings. She delivers lines with confidence and plays a strong lead character who, instead of needing to be saved by the male lead, is simply a heroine herself. “A Star is Born” weaves in musical numbers without being an actual musical. The music, which might even be better than the story itself, electrifies the audience. From slow ballads like “I’ll Never Love Again,” to powerful vocals in songs like “Shallow,” the film proves itself to the musical audience. While the show is slated to be nominated for multiple awards, such as the Oscars and Golden Globes, I wouldn’t be surprised if the soundtrack got nominated for a Grammy. Arguably, one the most emotionally compelling of the songs is “Shallow.” It displays the capacity of Gaga’s vocals as well as the vocals of Cooper, who is a newcomer to the music world. The music corresponds with the drama in the film, in particular with the issues the main characters face. For example, Maine’s career is on the decline while Ally’s is just starting out. Highlighting the effect that the music industry has on a one’s character, Jackson deals with substance abuse, depression and alcoholism while also trying to handle relationship troubles involving Ally and his own family. Still keeping the spirit of the 1976 version starring Barbra Streisand alive, the tone of film is warm with the setting of Southern California and other parts of the Southwest. The use of music is powerful in its symbolism. The line “That Arizona sky burning in your eyes,” from the song “Always Remember Us This Way” gives viewers a sense of Ally and Jackson’s relationship as it parallels the colors and layers of the Arizona sunsets. In the 1976 version, the scenery can be described as almost identical with scenes of the Southwest desert as the couple falls in love. “A Star is Born” is more than just the story of Jackson and Ally. It shows the depth of relationships in the music industry and how one’s entire life can be changed by one person. The film is emotional, taking the audience through every twist and pain Jackson and Ally face. It intertwines beautiful melodies and heavy guitar riffs to make a masterpiece from where stars are literally born within Gaga and Cooper as well.